^ "'Carrot Top' brings his own brand of humor to Prescott". The Daily Courier. Prescott, AZ. 22 October 1998. Retrieved 6 April 2019. ^ "On Top of the World - March 2016 - Orlando, FL". Orlando Magazine. Retrieved 2018-08-05. 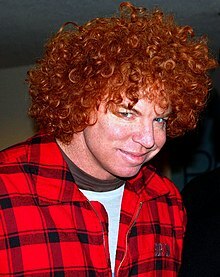 ^ "Carrot Top Biography". carrottop. 2008. Archived from the original on 2006-11-28. Retrieved 2008-07-19. ^ "Carrot Top". Comedy Central. Retrieved 2008-07-19. ^ "Carrot Top Biography". filmreference. 2008. Retrieved 2008-07-06. ^ "See Carrot Top at Luxor Hotel". Luxor Las Vegas. 2008. Retrieved 2008-07-19. ^ "The Tonight Show Starring Jimmy Fallon - NBC.com". NBC.com. Archived from the original on 24 September 2009. Retrieved 30 September 2015. ^ "Carrot Top Rubdown - Tosh.0 (Video Clip)". Comedy Central. Retrieved 3 April 2019. ^ "Tosh.0". Comedy Central. Retrieved 3 April 2019. ^ "Between Two Ferns with Zach Galifianakis: Bradley Cooper". Funny Or Die. Retrieved 30 September 2015. ^ ""Tom Green Live" Guest: Carrot Top (TV Episode 2014)". IMDb. Retrieved 30 September 2015.